Sharon Rowan sent over a link to some bold, graphic bookmarks she designed and offers for download. Help yourself right here. I printed out my faves, above. And you've heard of the popular new book, Pride and Prejudice and Zombies, right? Next up is Sense and Sensibility and Sea Monsters. I'm still waiting for Jane Eyre Plus Werewolves. Well, the Jane Eyre version is wishful thinking on my part. But Sea Monsters is for real! I kinda think that Pride and Prejudice and Zombie's gets a little predictable after a bit. But it's definitely unique and I love it for that. I have yet to read it, but I'm sure I will. I have a P&P obsession. I will read any crappy offshoot story just to spend more time with Elizabeth and Darcy. Oh I love these. Right now I'm using a chicken coupon card (looks like a chicken biscuit) from Chick Fil A. 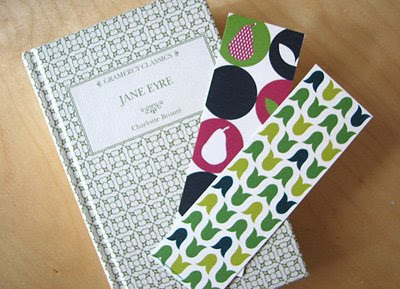 Those are gorgeous bookmarks. Thanks for the find! The guy that wrote Pride and Prejudice and Zombies is now working on Abraham Lincoln, Vampire Hunter. Heck yes! Having had to actually read (by which I mean "suffer through") Jane Eyre in ninth grade, I'm a little suprised, Jess, that you didn't think of adding vampires to THAT particular book, given how Gothic and downright dreary it already is. It would have fit the emergence of the winsome undead in English lit in the time period, after all. Thanks for sharing the link. I just purchased Pride and Prejudice and Zombies. The cover just sucked me in and I had to get it! I re-read Jane Eyre about every 8-10 years. It gets better every time. add some werewolves and I will love it even more. Note to self - go get this P&P with Zombies! I have to agree with Alfred...actually I'm convinced Jane herself is a vampire. All of her weirdness with thresholds & whatnot. Read it again with that in mind. You'll be surprised. Oh, how funky! Thanks for the link. My son is in the middle of Pride and Prejudice zombies...I'm just waiting for it but enjoying a Jennifer Weiner book at present.